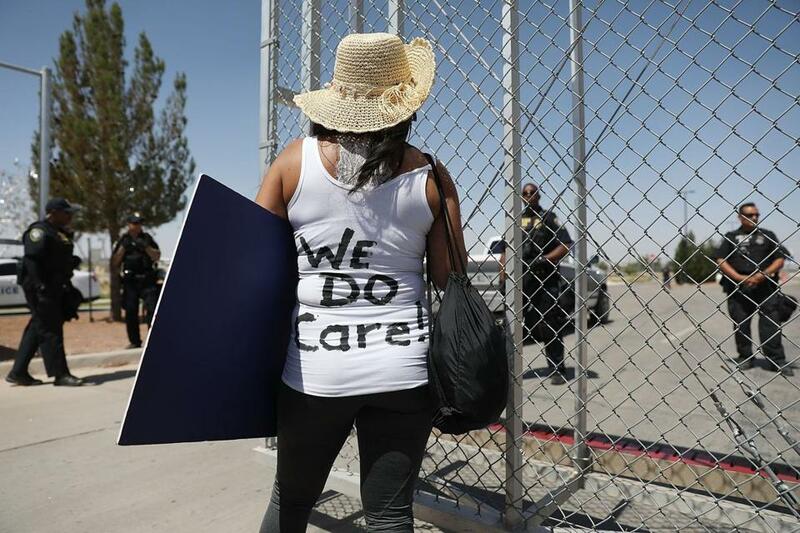 A protester wore her sentiment on her back during a protest at the Tornillo-Guadalupe port of entry gate on Sunday. WASHINGTON — President Trump on Sunday explicitly advocated depriving undocumented immigrants of their due-process rights, arguing that people who cross the border into the United States illegally must immediately be deported without trial. The statement sowed more confusion among Republicans ahead of a planned vote on an immigration law overhaul this week. In a pair of Twitter messages sent while being driven to his Virginia golf course, Trump described immigrants as invaders and wrote that US immigration laws are ‘‘a mockery’’ and must be changed to take away trial rights from undocumented migrants. The American Civil Liberties Union said in response that denying due process would be against the law. ‘‘What President Trump has suggested here is both illegal and unconstitutional,’’ said Omar Jadwat, director of the ACLU’s Immigrants’ Rights Project. About 100 people gathered Sunday at the Tornillo, Texas, border crossing to protest the separation of families. ‘‘Free the children now,’’ they chanted. The latest presidential exhortations came as House Republicans prepared for a vote on comprehensive immigration legislation, after a more hard-line bill failed last week. Neither bill has Democratic support, and prospects for the second one passing appeared dim, although the White House still supports it. Some Republican lawmakers are preparing a more narrow immigration bill that would address one of the flaws in Trump’s executive order mandating that children and parents not be separated during their detention. ‘‘I think, at minimum, we have to deal with family separation,’’ McCaul said. The 1997 ‘‘Flores settlement’’ requires that migrant children be released from detention after 20 days, but the new GOP measure would allow for children and their parents to stay together in detention facilities past 20 days. In the event that the broader immigration bill fails to pass the House this week, the White House is preparing to throw its support behind the narrower Flores fix, which is expected to garner wider support among lawmakers, according to a White House official. The tweet demoralized Republicans as they headed home for the weekend but did not end talks about what the House might pass. Marc Short, the White House director of legislative affairs, said Sunday that it was premature to announce which measures Trump would sign but urged Congress to act quickly to address the immigration issue broadly. Brendan Buck, counselor to House Speaker Paul Ryan, Republican of Wisconsin, said Sunday that a solution specifically dealing with family separation had been ‘‘a topic of discussion all week’’ but that there was not one policy or bill that Republicans had cohered behind. The president has balked at proposals from Senator Ted Cruz, Republican of Texas, and other lawmakers to add court personnel to help process more immigration cases. Many immigration hard-liners see it differently. Asylum applications and deportation proceedings go before immigration courts, staffed by judges who can make rulings without consulting juries. Cruz’s initial legislation on the border crisis proposed doubling the amount of immigration judges, from roughly 375 to 750. Attorney General Jeff Sessions has taken steps to strengthen the immigration courts, allowing them to process many cases without trials and limiting their ability to delay other cases.